Molveno in summer: relaxation, sports and nature all around you! Molveno as a resort is the ideal place for a relaxing holiday where you can enjoy sports and nature in the picturesque landscape of the Brenta Dolomites. The village is picturesque and gathered around the old village center, with cobbled streets of porphyry and narrow, winding streets. There are numerous places where you can taste typical menus and spend pleasant evenings with friends, all of your holiday is enlivened by numerous cultural, sports, folk, and music venues filled with interesting moments. For those who want a sporty holiday, the options that we offer are infinite: Mountain biking, tennis, sailing, windsurfing, volleyball, mini golf, a launch pad for paragliding, sports pool, adventure pool, archery, bocce, fishing and boat trips: enjoy these activities in your spare time with a light-heartedness, that cannot be not found in everyday life. Molveno also offers various opportunities for hikers of all levels: discover the Adamello Brenta Park, which you can reach either by ski lift, or simply walking through forest trails up to the Pradel Plateau (1,400 meters), an oasis of tranquility in a natural environment where your children can get to know the the animals in the petting zoo, exploring the surroundings in complete safety and freedom, or the adventure path "Forest Park" in order to experience the thrill of the Tibetan bridges, climb nets and much more. For the brave hikers we offer various trips and climbing routes, such as the famous path “Sentiero delle Bocchette" at your disposal to discover your very own Brenta Dolomites. 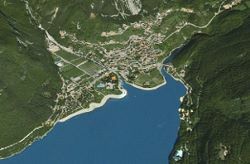 The main character of Molveno and the Trentino in the summer is and still remains the Molveno Lake, with its well-kept beaches, an ideal place to relax, but also to exercise a variety of sports. For those who want to spend a holiday full of relaxation and culture, you can discover more and more about the various legends surrounding the lake, visit the Gothic church of San Vigilio, you can experience romantic boat rides, walks around the lake, experience the sunset over the clear and fresh water, all this surrounded by the hospitality and warmness, which can be found in the Residence San Carlo. Molveno unites all the benefits of a mountain and beach holiday on its picturesque lake - enjoy a holiday away from the noise and heat of the city, without giving up swimming in the clear and fresh water. We await you!